With the economy rising to the top of Brits’ concerns, environmental concerns are no longer top of mind. In January 2007, 19% cited the environment as their top concern. A year later, it is down to 8%. Echoing its citizens’ change of heart, Gordon Brown and its government are backpedaling on green policies, from landfill, to transport, to renewable targets. Two paths. The latter one, the smart one, is led by the business sector. Last weekend, I caught a talk from Amory Lovins, from the Rocky Mountain Institute, and was struck by his insistence that business be the path to our salvation. Not the citizenry, not our government. One of the advantages of businesses, and even more so American businesses, is their emphasis on getting things done and on the bottom line. If business can smell money with green, as more and more do, we will have won a big part of the battle. 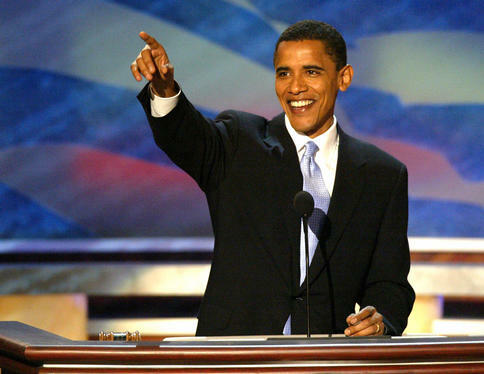 I listened attentively to Obama’s words, and felt encouraged by his speech. Part of me wished he would be more aggressive. But then, I have to remember, policy making is a process, and it has to start somewhere. My favorite moments were his speech to the guys in Detroit and the shots of his two daughters. Imagine for a second, if you were President of the United States, what would your plan for a sustainable world be? Would it be any different from Barack Obama’s? We are pleased to announce that the world’s largest general scientific society, the American Association for the Advancement of Science (AAAS), has become an official cosponsor of Science Debate 2008. You can read more about it here. Please expect more major announcements very soon. In case you missed it, you can hear one of our organizers, Shawn Lawrence Otto, talk with Ira Flatow on National Public Radio’s Talk of the Nation: Science Friday. Thank you for your help – the ONLY reason we are making this progress is because of your support. Check out the amazing lists of signers here and here, and please – forward this to your friends and colleagues and ask them to join this important initiative. Finally, we need some help. We have been personally volunteering full time for this effort, and throwing in our own personal funds, and we need to pay for more web hosting, travel, communications, and event organizing. Please consider making an online donation here. This is a very important initiative. I am hoping you will join me in supporting Science Debate 2008. Just one click! 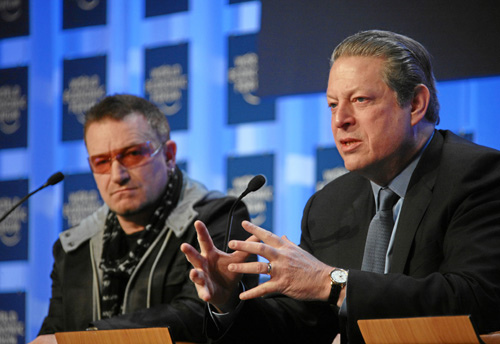 These two statements from Al Gore were made in the context of world market turmoil and the impact it has had on the content of the Davos discussions, shifting the attention away from global warming. In an earlier article, I shared Michael’s Oppenheimer‘s concern for that very issue, what Elke Weber calls the limited worry pool. The real danger is that world leaders and their people get distracted from the urgency of the climate fight, by an ongoing flow of crisis, as is the case currently with the financial markets. Tomorrow it could be a war, or a terrorist attack, . . . This reminds me of this family I saw years ago as a therapist. One of the children had been killed by the boyfriend’s mother, and she had gone on with her life trying not to burden the other siblings with her grief. The big issue in the family was the message she had sent to the other children, that she did not seem to value the life of their dead sibling, and hence their own lives. Every week the family came, and presented with yet another crisis, that ‘could not be ignored’. In the mean time, nothing changed and the family became increasingly at risk of disintegration. Not until I realized what was really going on, and I stopped reacting to each weekly crisis did we start the real work. Same thing with global warming. World leaders need to realize that there will always be a new crisis. However, the one crisis that supersedes all others is global warming. Nature cannot wait. Markets will return to normal. Wars will end. The damage that’s being caused to our living ecosystem is on its way to being irreversible. In the last year, the major TV networks asked the presidential candidates 2,679 questions. Pop quiz: How many were about global warming? Please forward this email to your friends, family, and co-workers. Climate change is one of the most pressing issues of our time. And polls show that voters care about it.3 But somehow, the TV networks never got the memo. NBC’s top political reporter, Tim Russert, didn’t ask a single question about global warming last year. Same for Sunday political show hosts on CBS and ABC. CNN asked just 1. Incredibly, Republican-leaning Fox bested them all with a grand total of 2. Our friends at the League of Conservation Voters will deliver your signature and comment directly to the TV networks at a press conference in front of their Washington, D.C., headquarters. And they’ll use our petition signatures to prove there’s public demand for TV anchors to ask about climate change. All it takes is one click. Back from a local training meeting for Obama volunteers. The room was overflowing with people, all fired up to go out and mobilize voters. This was my first time attending a political meeting, and the first time for many of the people there as well. I was thinking about the article I wrote regarding the Psychological Challenges and Opportunities of Global Warming, and the difficulty of getting people from being ‘concerned and unmoved‘ to being ‘concerned and moved‘. What is different this time with Obama, that moved me into action? Maybe there is something to be learned here, that can be applied to behavioral environmental srategies. What made me drive to the local Obama headquarters this morning was my enthusiasm for the man himself. I feel a personal connection with him, his values, and his journey. I respond to his charisma, and his qualities as an extraordinary leader, and uniter of all people. This morning I felt the power of the crowd, of no longer being just one person, but part of something greater, a chance to participate in history. And I have to agree with Michael Oppenheimer again, that ‘strong leaders can at least create the conditions where attention is paid to a key issue like global warming‘. What I may not be able to accomplish on my own, I may do as a follower of a charismatic leader such as Obama, and as a member of the (environmental) community that he is creating. This, by the way, does not mean, that I am to wait for Obama to get elected to do my personal share of the fight against global warming. Just Bragging . . .
What Are You Doing to Manage Your Water Needs? “6 Ways to Make Web 2.0 Work” or Just One? Google Earth is Becoming Google Water! One Day Maybe We Can Source All Our Food? How About Fair Volunteering with Time Banks?